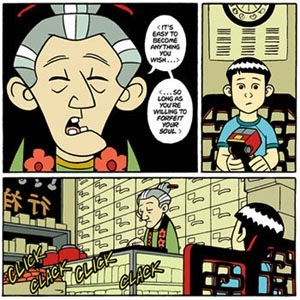 This month, we take a closer look at American Born Chinese by Gene Luen Yang. American Born Chinese is a 2006 National Book Award Honor Book for Young People’s literature, the 2007 winner of the Michael L. Printz Award honoring literary excellence in Young Adult literature, the winner of the 2007 Eisner Award for Best Graphic Album, and a 2007 Bank Street Best Children’s Book of the Year. In this work, Yang skillfully weaves three seemingly independent stories of Chinese folklore, a teenager’s need to fit in, and adolescents’ balancing of their Chinese American heritage. In an effort to show and tell the effects of racial stereotyping and assimilation, Yang presents one particularly egregious Chinese character, Chin-Kee, who has just arrived from China to visit his cousin Danny. Chin-Kee embraces all the negative Chinese stereotypes into one monstrous exaggerated whole. Chin-Kee’s eyes are pupil-less slits, he is drawn with a cartoon-like round face with two buck teeth. 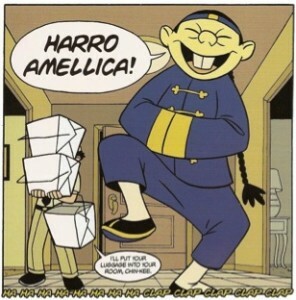 He wears traditional Chinese garments and speaks with the L/R switch (“Harro Amellica!”). It is this rampant stereotyping that has caused objections. Ironically, it is these exaggerations that empower readers to feel the shame of racial stereotyping from all sides — those who embrace the stereotypes, those who abuse and make fun of them, and those who are stuck in the middle, uncomfortable with these actions and reactions, and often uncertain how to respond. While this book has not been banned — to a large extent as a result of the tremendous support it has received from librarians and educators — it has often been deemed inappropriate because of its blatant stereotyping. 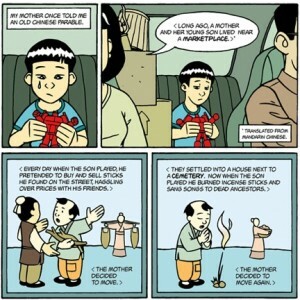 American Born Chinese is a brilliant weaving of cultural mores, expectations and racial stereotypes all battling assimilation and inherent justice, with ones’ need to fit in. It is a testament for all readers who struggle with developing and maintaining individual identities while fitting in with their larger more diverse communities. 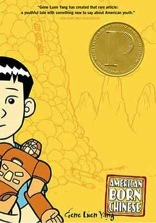 American Born Chinese is much like a poem for three voices. It tells three stories in three parts which come together at the end. Story 1 – The Monkey King begins “One bright and starry night” and introduces the Monkey King, who has been the leader of Flower Fruit Mountain since he was “born of a rock.” He hears a party in the heavens and as a deity in his own right rises through the heavens to join them, only to be laughed at because while he “may be a king…even a deity [he is] still a monkey.” The Monkey King returns to his home and lays awake, thinking of how he can change his fate. 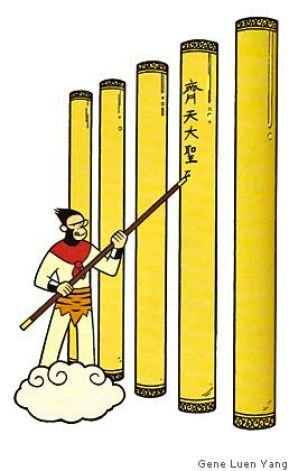 The Monkey King, angry at his rejection decrees that all his subjects wear shoes (they have an awful time of it in the trees), and he retreats to master various disciplines of Kung Fu. After years of practice and fervent study, he emerges transformed, larger than life, with a mission to show the other gods that he is now “a great sage equal of heaven.” He bullies and beats the other gods, who cry to Tze-Yo-Tzuh (He Who Is) for help. 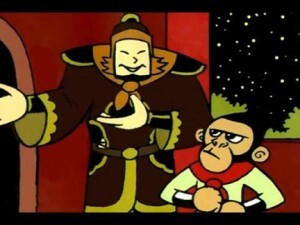 Tze-Yo-Tzuh asks him why he is such an angry monkey. The Monkey responds in anger that he is not a Monkey but a god. Part II ends with the Monkey King being trapped by Txe-Yo-Tzuh under a mountain of rocks for 500 years. The last part of his story is a tale of a hero’s trial / quest, acceptance, and redemption. When Jin Wang gets to his new school, his teacher makes false assumptions about his personal information when introducing him. She introduces him as “Jin Jang” and tells the class he’s from China. He meekly and embarrassingly corrects her: his name is Jin Wang, and he’s from San Francisco. At school Jin is always alone. His classmates make fun of his food and Chinese heritage, and the only kid who befriends him is the school bully who merely taunts him. A few years later another boy, Wei-Chen Sun, who has just come from Taiwan, is introduced to the class with a different teacher making similar false assumptions and mistakes (he is introduced as Chie-Chen Chun, from China). Unlike Jin Wang, Wei-Chen has a thick accent and even though Jin is sitting alone with no friends, he wants nothing to do with Wei-Chen…until he sees him playing with a transformer. Jin-Wang’s story continues with him in junior high-school. He has a crush on a girl in his class, Amelia, and is shy. His friend, Wei-Chen calls him a “turtle.” Eventually, Jin decides that the only way he’ll be able to successfully woo Amelia is if (like the Monkey King) he changes his appearance — to look more like the others. He “transforms,” and the rest of his story depicts the strains he puts on his friendship with Wei-Chen as he courts Amelia along with the challenges of young love. Story 3 – Danny and Chin-Kee’s Story, Part 1 opens with an image of Chin-Kee’s face — a cartoon-like caricature of a Chinese face with slits for eyes, two buck teeth, braided hair, and cap, with the title splashed across the page: “Everyone Ruvs Chin-Kee.” The story then unfolds in the pages to follow. Danny, about to ask his lab partner, Melanie, for a date finds out Chin-Kee is arriving for his annual visit. Danny is horrified. Chin-Kee arrives, sees Melanie and wants to bind her feet and to meet another girl like her in Danny’s school for a bride of his own. Danny and Chin-Kee’s story continues with Danny taking Chin-Kee to school. 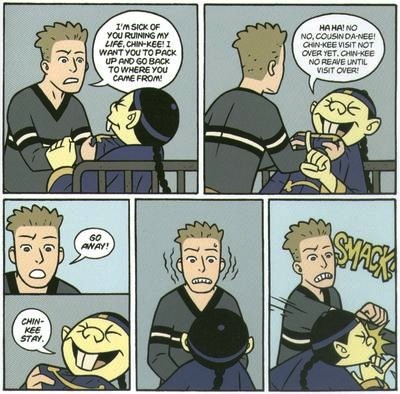 Danny is constantly embarrassed by Chin-Kee, who sometimes gives valid reason for this response and sometimes does not. As Danny tries to integrate into his new school and blend in, Chin-Kee is constantly making sure everyone is aware of his presence. 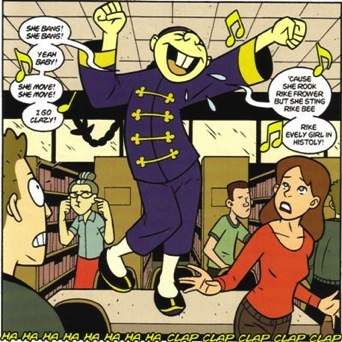 He sings loudly in the library (in his thick Chinese accent), he plays a prank on a “jock” Danny is trying to impress, and in each class Chin-Kee immediately shouts out the correct answers before anyone else can respond. 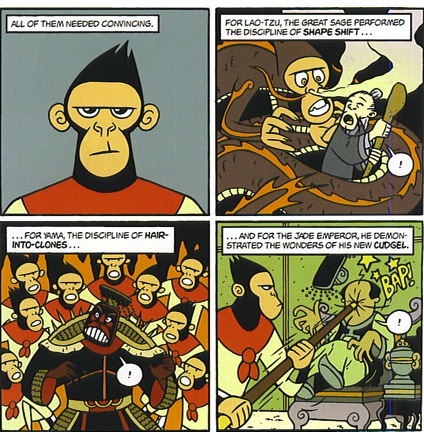 Towards the end, however, Danny and Chin-Kee’s story merges with Jin Wang’s and the Monkey King’s. We find out how they are all related, and are left to contemplate life’s choices, cultural and self-identities, assimilation, acceptance, and friendship. In short this is a story a of heroes, large and small, who must learn how to best fulfill their destinies while maintaining their identities and self-worth in communities that don’t always appreciate their strength and value. Means of achieving acceptance and redemption. Discuss the similarities and differences between American and Chinese folklore (along with any other cultures represented in your classroom / community / reading group). Discuss what it feels and looks like to be “different” from others and the importance of “fitting in.” Are there differences among looking different, acting different, and feeling different? If so, what are they and why? You may also want to address when it is worth changing to to fit in and when it is not. Divide the class into groups, each one representing a different racial / social / religious minority. Have them research the folklore of their target group and select their favorite tale. Then, have them write a script and reenact that story for the class. After group presentations, discuss the different folktales, in particular their similarities and differences, their lessons, and their impact. Discuss when one should forgive and forget and when one should fight or at least stand up for themselves and their community. Discuss how cultural values, folklore, styles, and preferences are woven into each of Yang’s three stories. Compare and contrast the White students’ reactions to Chin-Kee versus Danny’s reaction to Chin-Kee. Are there differences? Should there be differences? Compare and contrast how the characters of Jin Wang, Wei-Chen, and The Monkey King develop and grow. How are their courses similar and how are they different? Point out that Yang leaves us to wonder about the path and life choices Wei-Chen will take. Discuss the options he might take and the probability of his taking them. Discuss why Wei-Chin’s character is the one least resolved. Search for and discuss the many instances of irony across the three stories and how Yang uses it to shape the stories. Search for and discuss Yang’s use of idioms, slang, colloquialisms, and similes throughout American Born Chinese. Plot and compare the author’s use of language (vocabulary, slang, similes, idioms, etc.) and images as he relates and separates the three stories in the beginning and then relates and merges the stories towards the end. Discuss how Yang uses these tools as he weaves his story. Have students research and share their own cultural folklore. Compare and contrast how the stories are told / written. Compare and contrast the opening images and words for each of the stories (page 7, page 23, and page 43). How do the words and the images help distinguish the stories and set their respective tones? Have students hunt for visual and verbal examples of stereotyping throughout the book. Compare and contrast the visual and verbal means Yang uses to portray these stereotypes. On page 23, we see a young Jin Wang in the backseat of his parents’ car, crying while playing with a transformer and introducing a Chinese parable told by his mother. Discuss how the author relates Jin’s sadness and the flashback to the parable through image. On page 30 and then again on page 36, Jin Wang and Wei-Chen are introduced by well-meaning but clueless teachers to their classmates. Discuss how the images and text interact relaying the diverse actions and reactions of the students and teachers. On page 67, we see various gods, many of them bruised and battered and complaining to Tze-Yo Tzuh about the Monkey King. Discuss how these gods are portrayed in this folktale. Compare and contrast these gods with other gods of myths, such as those found in Greek pantheon. Discuss how Yang is able to incorporate Chinese cultural aspects into his portrayal of the gods. D’Aulaires Book of Greek Myths by Ingri and Edgar D’Aulaire: An introduction to the gods and goddesses of ancient Greece. Note that George O’Connor (First Second Books) is also putting out an exceptional collection of graphic novels accurately and creatively retelling the stories of the Greek gods. Joyful Noise: Poems for Two Voices and Poems for Four Voices, both by Paul Fleischman: Poignant, playful, powerful poetry for multiple voices. Dragonwings by Laurence Yep: An award-winning (Phoenix Award from the Children’s Literature Association and runner-up for Newbery Medal) historical novel depicting the Chinese American experience in San Francisco shortly after the turn of the twentieth century. The Absolutely True Story of a Part Time Indian by Sherman Alexie: About a bright motivated young Native American who must decide between a long commute to a better all-white school off the reservation (and face ridicule from white kids he must befriend and from his local friends he leaves behind) or to remain with his friends at the reservation’s limited high school and head nowhere fast. A Farewell to Manzanar by Jeanne Wakatsuki Houston and James D. Houston: A memoir about their family’s internment at the Manzanar concentration camp during World War II, where upstanding and honorable Japanese Americans were sent during the war simply because they shared a cultural heritage with our enemy. So Far from the Bamboo Grove by Yoko Kawashima Watkins (semi-autobiographical memoir): This work takes place during the last days of World War II as Yoko and her family flea from their home in Nanam, North Korea and end up, eventually in the United States, and must face hardship and ridicule throughout their arduous journey. Key ideas and details: Citing textual evidence, determining a theme or central idea, describing how a plot unfolds, analyzing how particular elements of the story interact; analyzing how particular lines of dialogue or incidents of a text reveal aspects of a character or provoke a decision; and analyzing a particular point of view or cultural experience from outside the United States. Craft and structure: Determining the meaning of words and phrases including figurative and connotative meaning; analyzing how particular sentences, chapters, scenes or stanzas fit into the overall structure of a text; explaining how a point of view is developed; analyzing how a text’s structure or form contributes to its meaning; analyzing a particular point of view or cultural experience reflected in a work of literature from outside the United States; and describing how a text presents information. Integration of knowledge and ideas: Comparing and contrasting texts; distinguishing among fact, opinion, and reasoned judgment in a text; analyzing how a modern work of fiction draws on themes, patterns of events, or character types from myths, traditional stories, or religious works describing how the material is rendered new; analyzing how an author draws on and transforms source material in a specific way. Range of reading and level of text complexity: Reading and comprehending literature, including stories, dramas, and poems; in the grades 6-8, and in the grades 6-10 text complexity band proficiently, with scaffolding as needed at the high end of the range. Knowledge of language: Using knowledge of language and its conventions when writing, speaking, reading, or listening; applying knowledge of language to understand how language functions in different contexts, to make effective choices for meaning or style and to comprehend more fully when reading or listening. Vocabulary acquisition and use: Determining the meaning of unknown and multiple-meaning words and phrases; demonstrating understanding of figurative language, word relationships, and nuances in world meanings; and acquiring and using accurately grade-appropriate general academic and domain-specific words and phrases. Research to build and present knowledge: Drawing evidence from literary or informational texts to support analysis, reflection, and research. Comprehension and collaboration: Engaging effectively in a range of collaborative discussions building on others’ ideas and expressing their own clearly. Presentation of knowledge and ideas: Presenting claims and findings, sequencing ideas logically and using pertinent descriptions, facts, and details to accentuate main ideas or themes. 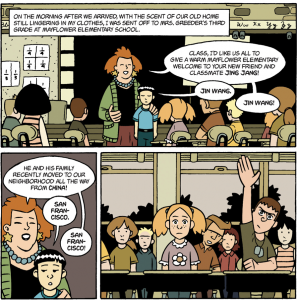 All images (c) Gene Luen Yang.